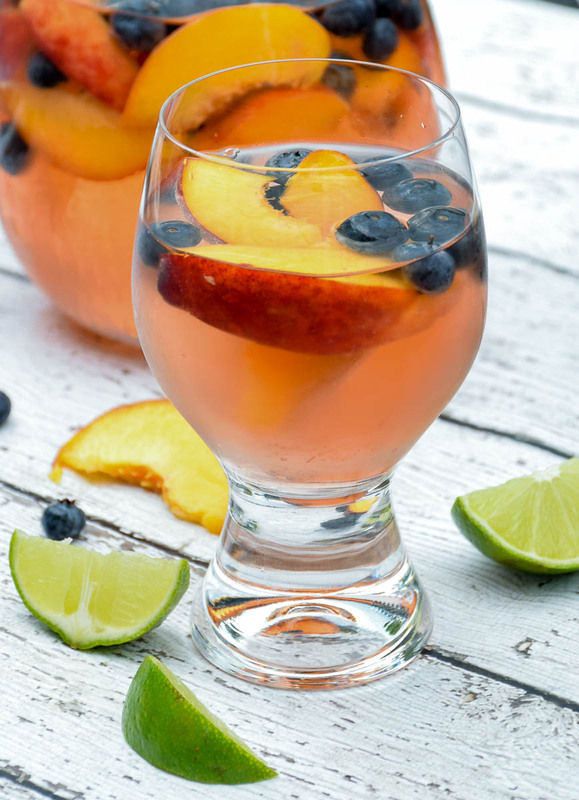 Make a splash this summer with this Sparkling Peach Sangria! Full of peach flavor, this beverage is refreshing, delicious, and perfect for those adult summertime celebrations. Sweetened with Torani Peach Syrup and brightened up with sparkling water, this peach filled beverage is sure to be a hit with your friends! I love to bring out cool, refreshing, and special beverages like Sparkling Peach Sangria in the summertime! The aroma of peach is enough to put me on cloud nine! 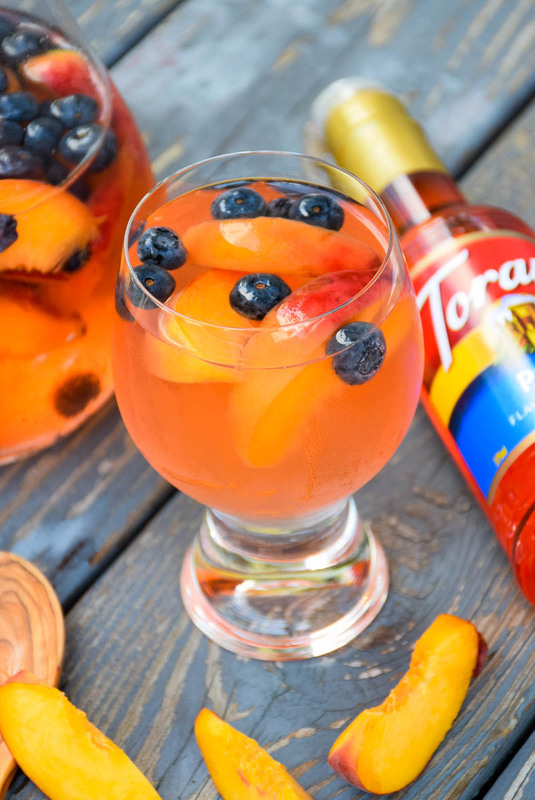 So, when I found out that Torani had a peach syrup, I knew that I was going to use it in a sangria recipe! 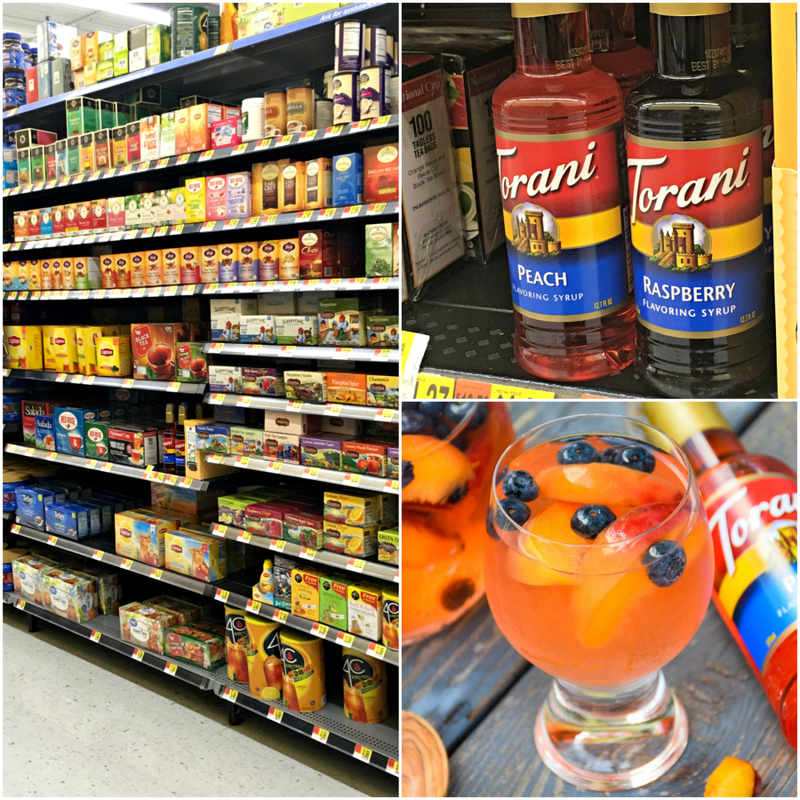 These three new Torani Syrup summer flavors are located in the tea aisle at Walmart. There is Raspberry, Peach, and Passionfruit. All three flavors would work great in this sangria! Just switch up your fruit and syrup and voila, you have a new recipe! You can also flavor your morning coffee with Torani Syrups found in the coffee aisle. Nothing is more refreshing and delicious to enjoy than an ice cold beverage when those hot sultry days come around. The unique flavor from the syrup made this sangria even more special with the natural sweet peach flavor really coming through! 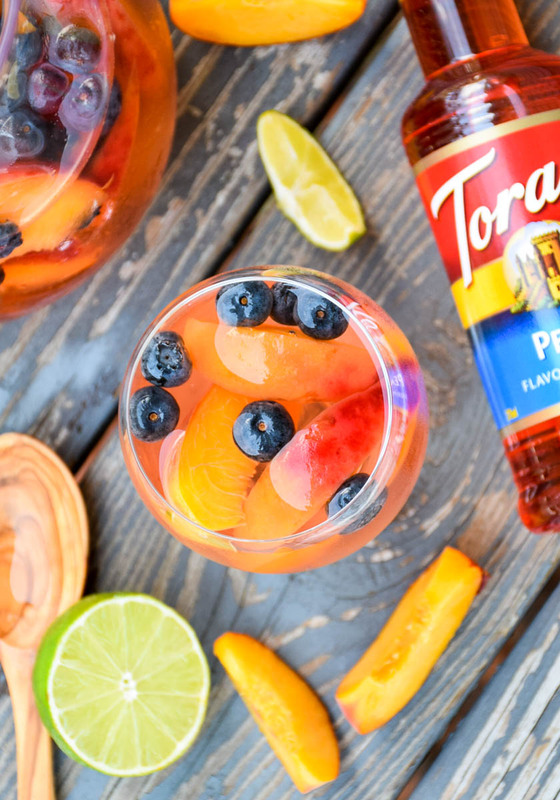 Made with real, simple ingredients like pure cane sugar and natural flavors, Torani Syrups can lend to many possibilities from mixed adult beverages to iced teas, sodas and more! What kind of splash will you make with Torani? Get more inspiration on Torani’s WEBSITE and INSTAGRAM account! Place sliced peaches and blueberries in large glass pitcher. 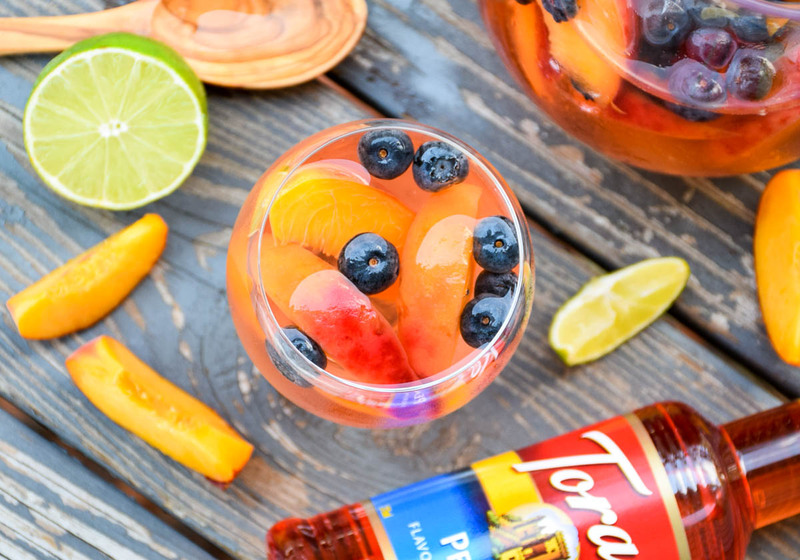 Pour Torani Peach Syrup, peach flavored rum, wine, and sparkling water over top of fruit. Stir and refrigerate at least 2 hours, until cold. The longer the sangria sets, the more color will develop in the sangria. If you like the color, I recommend making it a day ahead and leaving the sparkling water out until right before serving. Pass me the pitcher please! WOW! Looks yummy but it doesn’t say when to add wine. Hello Aunt Sue, the wine is added when all the other ingredients are added. It is also noted that if you wanted to premake this, that you should not add the sparkling water until just prior to serving. Hope you enjoy!